Triple distilled whisky like Jameson isn't just born smooth and balanced. It takes a carefully crafted process used over hundreds of years to get it just right. This tradition began in 1780 with the great Master Distiller John Jameson who discovered that three distillations was best for his Jameson Irish Whiskey and they continue his legacy to this day. 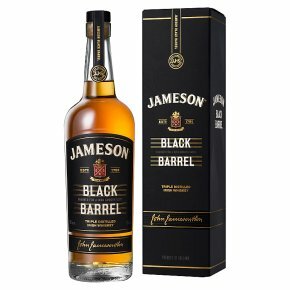 Jameson Black Barrel Irish Whiskey is a tribute to our coopers, who painstakingly give their barrels an additional charring to reveal their untold richness and complexity. Charring is an age-old method for invigorating barrels to intensify the taste. Time spent maturing in these double-charred barrels lends our whiskey a unique richness, with more intensified notes of vanilla sweetness and caramel, alongside toasted wood, fruit, and warm spice. Jameson Black Barrel - triple distilled, twice charred, for a rich smooth taste.